Flipkart Mobile Bonanza Sale to offer discounts, exchange, and buyback on top smartphone brands in India. Flipkart sale starts 19th February. Get unbelievable offers on best selling mobiles for four days from 19-23 Feb. 10% Instant discount with Axis Bank Credit/Debit cards. Flipkart is back with its "Mobile Bonanza Sale" with some amazing offers on latest mobiles. The sale starts on 19th February. Whether you are looking for an entry-level mobile or a smartphone, this is the chance to get one, you will get the best deals on all the top brands. This sale has been divided into different sections and in every section, you will get different offers on amazing smartphones with latest features. Meanwhile, you can check Flipkart online offers on fashion, electronics, kids products, groceries and more. Here are all the details of upcoming offers in Mobile bonanza sale. You will get all the smartphones which have the latest feature at less price. Flipkart has already revealed the best offers of its mobile bonanza sale. Asus ZenFone Max Pro M1, Realme 2 Pro, Poco F1, Vivo V11 Pro, & Google Pixel 2 XL get a price cut. You also get mouthwatering deals On Budget Phones such as Panasonic P101, Panasonic P90, Micromax Bharat 5 Pro, iVoomi iPro, Micromax Spark Go, Yu Yureka Note, iVoomi Z1. In addition to that Flipkart is offering a buyback guarantee, exchange bonus, and mobile protection plan. After the just concluded Flipkart Big Billion sale, here is one more opportunity to catch amazing discounts on top smartphone brands. 10% instant discount on the purchase of select mobiles with Axis Bank Credit/Debit cards. The offer is also applicable on EMI transactions using Axis cards. Min. cart value: INR 5999. Now, select the mobile that you want to purchase. Go to your cart and click on Proceed. Now, fill all the details for example Name, Address etc. Complete the payment and that is it. This time in the Flipkart Mobile Bonanza get a discount of Rs. 7,000 on Samsung Galaxy On8. The smartphone with infinity display comes with dual rear cameras of 16MP + 5MP. You get a 16MP front shooter for selfies. Galaxy On8 is powered by Snapdragon Qualcomm Processor 450 along with 4 GB of RAM and 64 GB of ROM. The fingerprint sensor is on the rear side. You also get face unlock feature on Galaxy on8. Realme 2 pro is one of the most popular smartphones in this price segment. You get Snapdragon 660 Chipset along with up to 8GB of RAM. After its launch, Realme 2 Pro is available on discount for the first time. The price starts only Rs. 12,990 for the 4GB RAM Variant. Realme 2 Pro comes with 6.3-inch FHD+ display with dewdrop notch. Zenfone Max Pro M1 is a highly rated smartphone possibly among the best of 2018. It offers value for money and with the mobile bonanza sale, the deal gets better as the prices start only Rs. 8,999. Zenfone Max Pro M1 Comes with powerful specifications which include Snapdragon 636 chipset. And a massive 5000mAh battery. You also get dual rear camera setup of 16MP + 5MP. The Zenfone Max Pro M1 offers pure Android experience with a near stock interface. Samsung Galaxy On6 price gets slashed by flat Rs. 2,000. The smartphone will sell at Rs. 9,990 down from its original price of Rs. 11,990. The Galaxy On6 comes with 4GB of RAM and 64GB of Internal storage. The headset boasts a 5.6-inch HD+ display. It is powered by a 3000 mAh battery. You get a 13MP rear & 8MP front camera. 4 GB RAM | 64 GB ROM | Expandable Upto 256 GB. 14.22 cm (5.6 inch) HD+ Display. 13MP Rear Camera | 8MP Front Camera. 1.6 GHz Exynos Octa Core Processor. Asus Zenfone 5Z variant with 8GB RAM and 256GB internal storage will get a flat discount of Rs. 5,000. You get a 6.2-inch Full HD+ Display. The headset has a 12MP + 8MP on the rear and 8MP front camera. It is powered by Qualcomm Snapdragon 845 Octa Core Processor. Asus Zenfone price during the sale will be Rs. 31,999. There is also a second variant of 6GB RAM & 64GB internal storage priced slightly lower. Recently, the best selling smartphone of this year got a price cut. Buy Redmi Note 5 Pro at Rs. 13,999. During the mobile bonanza sale, the Xiaomi’s mid-price smartphone will be available with additional offers. 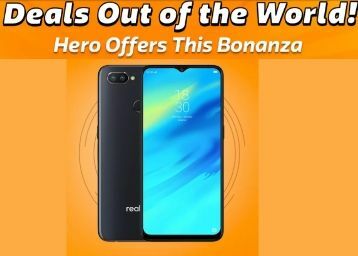 If you have been waiting for a price cut on Redmi Note 5 Pro your wish comes true as the smartphone has finally received a discount. It is also available with exchange and no cost EMI on select bank cards. The smartphone launched in April 2018 will be down from its original price of Rs. 16,990. You can grab Vivo V9 Youth for as low as Rs. 11,990 during the upcoming Flipkart Sale. Vivo V9 & Vivo X21 will also get a price cut. Vivo X21 will get extra Rs. 6,000 OFF via exchange. The special price of Vivo X21 in the sale will be Rs. 31,990. 4 GB RAM | 32 GB ROM | Expandable Up to 256 GB. 16.0 cm (6.3 inch) FHD+ Display. 16MP + 2MP | 16MP Front Camera. The smartphone launched last month starts Rs. 71,000. Google Pixel 3 comes with a 5.5-inch display. The Pixel 3 boasts a 2915 mAh battery with fast charge support. The primary camera of Pixel 3 is 12.2MP. It has an 8MP + 8MP dual rear cameras. While the Pixel 3XL boasts a slightly bigger 6.3-inch display. Both the headsets are powered by Qualcomm Snapdragon 845 64-bit Processor. Pixel XL# also has a bigger battery of 3430 mAh. 4 GB RAM | 64 GB ROM. 13.97 cm (5.5 inch) FHD+ Display. 12.2MP Rear Camera | 8MP + 8MP Dual Front Camera. Qualcomm Snapdragon 845 64-bit Processor. Complete Mobile Protection at Rs. 99. Min Rs. 750 OFF on your Old 3G phone. Never Before Prices Galaxy On6. Realme 2 Sale on 19 Nov, 12 Noon. The impressive line of budget smartphones on offer include Yu Ace, Infinix Smart 2, Panasonic P90, Micromax Bharat 5 Pro, and Micromax Sparx Go among others. Panasonic P90 will be available at Rs. 3,999. If you move slightly up more options emerge such as Panasonic P101, Infinix Smart 2, and Lenovo A5. Flipkart is offering a minimum of Rs. 750 off on exchange of any 3G phone. Infinix Smart 2 comes with impressive features like face unlock and HD+ display. WhileYu Ace has a 4000 mAh battery and 13MP rear camera. Get up to Rs. 6,000 extra on the exchange of your old phone during the mobile bonanza sale. Flipkart offers an additional Rs. 6,000 OFF exchange bonus on Vivo X21. On LG Q Stylus, you get extra Rs. 5,000 OFF on exchange. The exchange bonus is extra savings, you get in addition to the discounts on these popular smartphones. Minimum exchange bonus of Rs. 750 for the old mobile phone. Flipkart is also promising the best prices on Apple iPhones. However, the deals of Flipkart Mobile Bonanza sale on iPhones are not revealed yet. In the Flipkart Sale, complete mobile protection plan will be available for Rs. 99. The protection plan covers accidental screen damage, hardware/software issues, water damage and even theft. The protection plan will be available to buy at an offer price almost on all smartphone brands including Samsung, Asus, Realme, Oppo & more. You can choose to buy the plan from the product page by paying Rs. 99 only. The buyback offer will be available on select smartphones. Oppo F9 & F9 Pro will be available with assured 70% buyback offer. Apart from the buyback guarantee, both smartphones will get up to Rs. 5,000 OFF. Oppo F9 will sell at discount price of Rs. 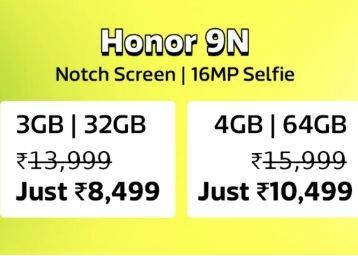 18,990 while F9 Pro will get a price cut of Rs. 2,000. You get the best value for your phone. After selecting a product to buy, add buyback guarantee to cart. Flipkart Mobile Bonanza 2019 has all the ingredients of an epic sale from amazing discounts to extra exchange bonus. You get lowest prices along with benefits like complete mobile protection & buyback guarantee. Stay tuned for the soon to be revealed deals and shop during the sale to grab the best discount on your favorite mobile.